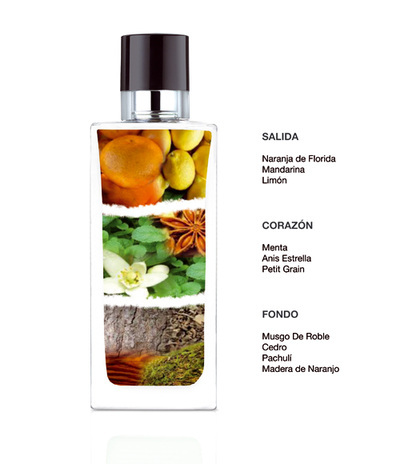 Madera de Naranjo Eau de Toilette pour Homme by ANGEL SCHLESSER evokes de intensity of the Mediterranean luminosity with a base of citrus, wood and aromatic spices. ​As a start the vigorous strength of the orange is revealed, then the lemon and the tangerine kindly impose the stimulating vivacity of this fragrance. The heart of this fragrance is fresh but spiced. Surprisingly with its unusual hints that harmoniously combine with the green mint, the aromatic star anise and the minuscule petit grain. In the end it melts with delicacy de slight notes of wood: from the orange tree, the cedar and moss of oak tree, all mixed in with the sensuality of the patchouli.